I had an interesting conversation the other day with a dedicated yoga practitioner and teacher who was passing through and wanted to do a practice with us. The conversation arose around them asking if it was okay for them to practice some add-ons and modifications to the practice. They explained that it was common practice to do this once you were an experienced practitioner and that he has recently done a workshop with a senior Ashtanga Teacher who had fully approved this and actually used this as an example to other students. 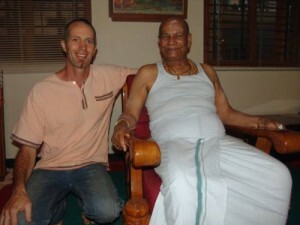 I said that if he wanted to practice with us in our “Open” sessions I would expect him not to add any extras on or modify, but to practice as closely to the method that Guruji taught me as possible. Of course he graciously agreed to do this especially once I gave my point of view on the matter. I want to use this blog to expand a little on my feelings on this. I have been practising Ashtanga Yoga since Oct. 1992 so I guess that qualifies me as “experienced”. And yet, in all that time I have tried to do so exactly as I have been taught, first by Peter Sanson, then by Guruji and then Sharath. Even after a quarter century of practice, each time I get on my mat I do my best to practice exactly the method as Guruji taught it to me. I start each practice with the invocation “vande gurunam caranaravinde” or “I bow to the lotus feet of my guru and the lineage of gurus”. It seems to me that to chant this and then do whatever you please in the practice is a little strange. Now I know that people say that Guruji changed what he taught over the years, but in the time I regularly traveled to Mysore between 1994 and 2004 he never changed the method. His emphasis may have evolved and may have been different for different people with different needs, but the method was the same. 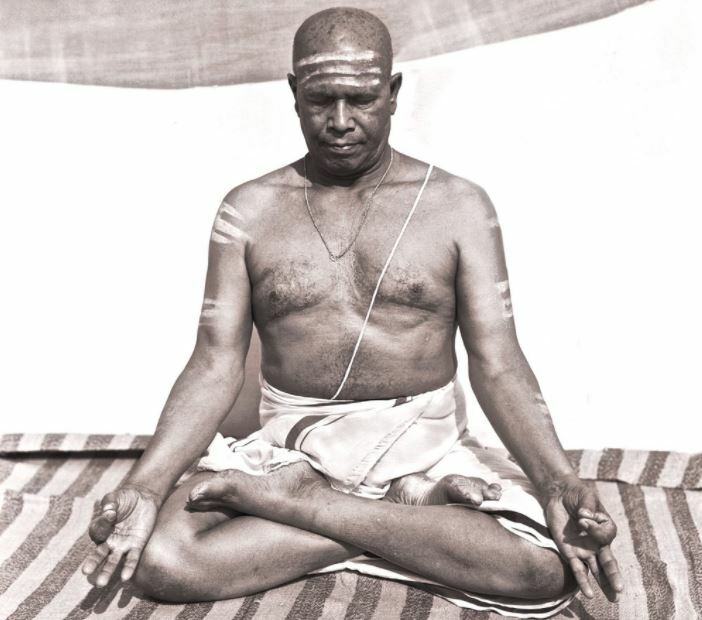 In fact he stated categorically on several occasions that he had changed nothing and that he was teaching exactly what he was taught by his guru, Krishnamacharya. I never had any reason to doubt this and still don’t. In some ways, this question is irrelevant. Just because the Guru may give the method to different people in different ways, doesn’t give us as students the right or the prerogative to do the same. Certainly not unless we feel we have reached “Guru” status ourselves, and I, for one, know I am a long, long way away from that. Does this mean that I expect all of the people who come to Te Aro Astanga Yoga to rigidly adhere to the sequence at all times? No, because people come to me for all sorts of reasons. However, the changes I may make are very minor and they are always with the intention of moving that person to the correct sequence sooner rather than later. None of us will ever practice “perfectly”. All of us on certain days will modify a little, especially if we are dealing with an injury or pain but for me, I am always trying to find a way to practice as I was taught. And you know what? It works. We need to always remember that what we are doing is “citta vritti nirodhah” – stilling the fluctuations of the mind. The essence of achieving this is discipline and the first practice of discipline is to do as your Guru instructs. I know that many people, senior teachers among them state that their practice is their “Guru”. They say that their own body knows best. In my opinion, this is misunderstanding the Guru concept. Your practice is not your Guru, it is what your Guru tells you to do. We have certain habits in our bodies, samskaras, and our body will lead us in that direction if we let it. The role of the Guru is to give us a method to break those habits, our practice, and to tell us when we stray from our practice, and to support us when we struggle with our practice. Modern day people struggle with this concept and modern day yoga seems to be moving away from it. So many of the modern yoga practices are “Guru-less”. There is no parampara, no lineage. No-one wants to practice with humility. No-one wants to do the hard work. Instead, yoga should make you feel good and look good. Pain is bad. Want to do handstands? Don’t wait until your guru says you are ready, just attend a “Handstand Workshop”. Want to experience a high? Just go to a “Yoga Trance Dance” workshop. Is this yoga? Maybe it is. Maybe it works for some people. But it sure isn’t traditional yoga and it sure isn’t what Guruji taught me and I trust what he taught me more than anything else, because it continues to work for me. It continues to lead me in the direction of “vritti nirodhah” and it continues to lead me onto my mat everyday. This is an inspiring blog Mike. I really respect your approach. Not hip and cool but full of integrity. I am pleased to have your teaching even in this way.Thank you. I’m struck agog by the importance of your message. It inspires me to recommit to the practice as it is. Desiring to change it in any way is nothing other than the monkey mind chattering, the very thing our practice was devised to silence! Integrity IS EVERYTHING! And humility. It makes a person/teacher trustworthy. I personally have tonnes of respect for the way you are doing it Mike – staying true. Keeping it real. Nice and simple – and full of substance! I love it. Nga mihi nui. Thank you for that incredibly inspiring and reassuring blog. So well written. I asked Peter Sanson how can we protect ashtanga yoga from becoming a hodge podge trance dance and he emphasized the points you made. Thank you for being true to the parampara and your Guruji. With your shelter we won’t go astray. Mike this is the best blog. How fortunate we all are to be with this teaching for our lives and to share it with you and Peter and all the wonderful people that enter the studio. Thank you Maggie. I am fortunate to have such wonderful people who make up the Te Aro Astanga Yoga community. As a very new beginner makes sense to me. I wanted to take up yoga and looked at other classes and listened to others who practice for a couple of years. Then my friend told me about your studio. Something clicked, I am comfortable with imperfection. Great blog.